Launch of "A GREAT SACRIFICE"
The committee's aim is to commemorate and endeavour to keep alive the names and the tradition of those from the Bandon area who fought and those who died in the two World Conflicts. A Footplate has been added in recent years to our memorial stone dedicated to Irish Personnel who lost their lives on United Nations service. It is to promote a wider awareness of the forgotten Irish men and women who served, fought and died in the Great War 1914-1918. We believe that a better understanding of the shared heritage of sacrifice now will help to reconcile the two major traditions on the whole of this island. The volunteers came from every class, religion and location.Their reasons for enlisting were as varied as we are different. Irish history show that over 210,000 Irish soldiers took part in the First World War 1914-1918. 35,000 were killed never to return to Irish soil. Also Irish women served as nurses in field hospitals close to the battlefields. 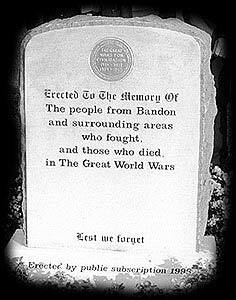 Over 200 Bandon & District soldiers that we have researched are buried on foreign soil and long forgotten at home in Ireland.